So here I am, back in Washington DC on Super Tuesday (writing this the day before I post), observing a racist litigious pathological liar, serial bankrupt and (it almost goes without saying) climate change denier head towards the Republican nomination. Anyhoo, I’d better get this blog updated on my February DC art-science activities before House of Cards Season 4 starts on Friday, because that’s going to wipe out this weekend. February started strategically with a meeting of SEAD (The Network for Sciences, Engineering, Arts and Design) Working Group hosted by the National Academy of Sciences. The group shared and discussed trends that have emerged in the last few years since the network’s White Papers initiative in 2012, the outcome of which was published by MIT Press as ‘Steps to an Ecology of Networked Knowledge and Innovation‘. I was asked to present to the meeting on the international context for art, science and technology – a wide brief for a fifteen minute presentation! Luis Girao from the EU was also present for part of the day and spoke about the EU’s STARTS initiative. The meeting follows the recent National Academies launch of the planning phase of a project to examine the value of incorporating curricula and experiences in the arts and humanities into college and university STEM (science, technology, engineering and mathematics) education and workforce training programs, as well as integrating more STEM into the academic programs of students who are majoring in the humanities, arts and related disciplines. From strategy to academia, I dived straight into the massive College Art Association annual conference, this year in Washington DC, which included a panel discussion on ‘Cultivating an Ecology of Networked Knowledge & Innovation thru Collaboration among Sciences, Engineering, Arts & Design’, moderated by Leonardo Executive Editor Roger Malina. Malina noted that the current enthusiasm for “STEAM” – the introduction of art into science and technology teaching – is driven and shaped by the desire to attract and retain more scientists and engineers, rather than for having more science/technology-informed artists. I would say this is true on both sides of the Atlantic. Panel member Nettrice Gaskins gave an inspiring presentation on the art/science programme she runs at the Boston Arts Academy, and noted that she had found it easier to get artists to engage with science, than to get scientists to engage with the arts. There was also a great talk by biologist Nickolay Hristov about his work at the Center for Design Innovation (CDI) in North Carolina, where he studies bats and develops new techniques for filming and visualising bats. In the overwhelming number of sessions, panels and talks at the CAA conference, one of my standouts was the ‘Ecologies of Creative Activism’ session, organised by the New Media Caucus, where I found much potential fodder for the Arte Util archive, including the work of ecoarttech – a delightful project on goat keeping and Desert Art Lab‘s community cactus gardens. Amazing to catch up with some wonderful artists from different parts of the world converged on DC for the CAA meet, including Jane Prophet, Marta de Menezes and Armin Medosch. Fantastic conversations. During the month, I also enjoyed the latest edition of DASER (DC Art Science Evening Rendezvous), again at the National Academy of Science, which had some cracking talks, including Richard Foster’s illuminating reflections on creativity, a subject which usually makes me nod off, and architect Philip Beesley’s talk on his fascination with non-repeating geometries and living architecture: his idea of a new approach to shelter that is gentle and responsive to nature, rather than rigidly repelling natural forces. Video of the talks here. Beesley’s Sentient Chamber, created by a group of architects, engineers, scientists, and artists in his Living Architecture Systems Group at the University of Waterloo, Canada, was installed upstairs from the DASER salon as a site-specific interactive work in the National Academy of Sciences’ spectacular building on Constitution Avenue. 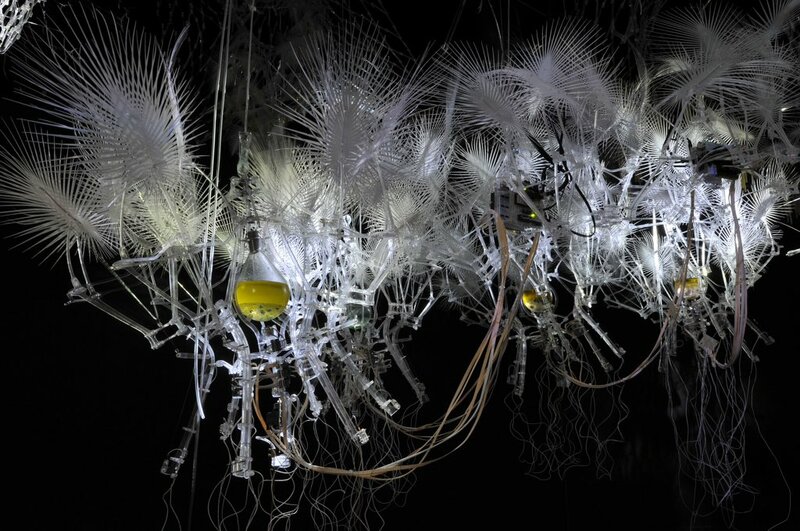 This experimental and delightful work incorporates new lightweight structures, interactive robotics, and ideas from synthetic biology to pursue an architecture as close to being alive. In form, the artwork is a suspended translucent artificial forest that reacts to your presence with changing light and murmuring sounds. Both the exhibition and the DASER series are organized by CPNAS – the National Academy of Sciences’ Cultural Program – which is led and championed by curator JD Talasek, who attracts my huge admiration for the quality, breadth and boldness of the contemporary art program that he has introduced and sustained at the NAS for several years.